Lawn core aeration involves perforating the soil with small holes to allow air, water, and nutrients to penetrate the grassroots. This helps the roots grow deeper and produce a stronger, more vigorous lawn. The main reason for aerating is to alleviate soil compaction. Compacted soils have too many solid particles in a certain volume or space, which prevents proper circulation of air, water, and nutrients within the soil. We use a ride on core aerator by Exmark, which works much better than any walk behind core aerator you can rent as a do it yourself. This massive machine is guaranteed to pull plugs as you have never seen before. We begin our core aeration every year in May for warm season grass Bermuda Zoysia, when the grass is actively growing. This is the absolute best time to have your warm season lawn core aerated for a number of reasons. One, the grass can heal and fill in any open areas after soil plugs are removed. Two, typically lawns are a little softer during this time of year, which allows us to pull much better plugs. Finally, crabgrass has already passed its germination period, so the holes from the core aeration will not be a bed for unwanted weeds. This additional service can be added to your lawn care program for an additional cost. Visit our contact page to submit your request. When Should Core Aeration Be Done? 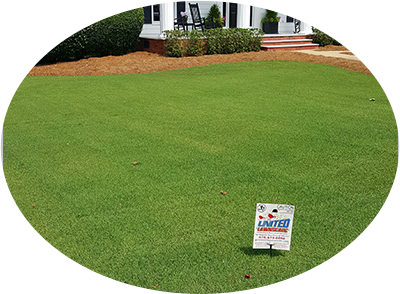 We strongly recommend your lawn be core aerated every year or at minimum every 2 years only if you have a built-in irrigation system in Georgia due to the very high matter of clay soil. There has also been a number of new homes built in the past 10 years in which builders have installed new sod on top of very poor soil and even rocks. When these rocks heat up during the summer at 90-100 degree temperatures, they cause the lawn roots to burn in stressed and damaged turf, especially if you are not watering enough and your soil is compact. Granular fertilizer is released slower and requires regular water to maximize its effect. While core aerating the soil helps the plant take in more of the nutrients from the fertilizer, it is also important to test your soil for any mineral deficiencies. A low soil pH level can prevent your lawn from reaching its full potential. If your lawn is fairly new or your soil has never been tested and you can’t figure out what the problem is, we can help. 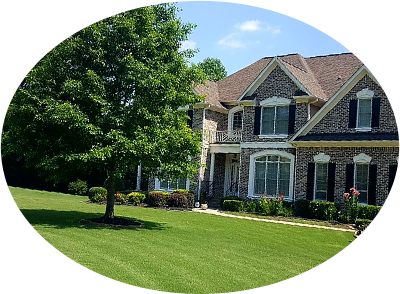 Visit our contact page to submit your request and allow our lawn specialist to provide you with a free lawn analysis.